After a decade of blogging about the good, the bad and the ugly side of the three consecutive Conservative government's since 2006, it is great to see them go. I have to admit that it was a bittersweet win. I feel the leader did a great disservice to my good friend Scott Andrews who should have been the Liberal Candidate in Avalon. More on that at another time. Despite that, it is also great to see the Liberals - our country's national governing party - back at the helm. At the end of a grueling campaign, Canadians voted with their feet to strategically toss the bums out. They were taking no chances on splitting the vote. Voters went with the progressive image of "change" hoping for a better future. Canadians were embarrassed by Harper's social engineering and negative re-branding of our great nation. This was not our Canada. This was truly our last chance to rescue Canada - to restore our coveted Just Society built on a sense of justice, transparency, on a sense of respect for all citizens, a fair place to live and above all else, respect for our democratic traditions. That is why we have a much beloved Constitution and a Charter of Rights and Freedoms. These are the values that we covet. These are the principles through which we became the envy of the world. The things that made us a truly democratic country. Harper hated these things. He held Liberal - Canadian Values - in disdain. When the country learned that over the Thanksgiving Weekend some 3.6 million people had voted in the advance polls- a 71 per cent increase over 2011 - the magnitude of the desire for change was clear. Voters were tuned in. It was not if Trudeau would win,but by how much. The Liberal Party now firmly occupies, once again, the political center in our country. This is exactly where the party has governed best over the generations. The Liberal Party of Canada is once again the big-tent party of progressives and business. The Liberal Party and the values most Canadians identify with are one, and the same. Canadians believe in fiscal responsibility, peace, justice, tolerance, equality and and the need for a strong national government that respects the provinces. Liberals came home, new voters went with the best choice to unseat the dreaded Conservatives and Justin Trudeau emerged as the agent of change. His message of hope made him the only choice for Prime Minister for most voters in Canada. It was obvious when the three way race broke wide open - that this was a race between Trudeau and Harper. For a couple of weeks before e-day, it was getting clearer that the Liberals had all the momentum and potential needed to win a majority that reflected the type of wins that kept the Liberal Party of Canada in power for so many decades. It was not anybody but Harper, but Trudeau over Harper. Canadians felt Trudeau was our best hope for a new direction. He appealed to new voters, the middle-class and those over 50. A few of my pundit friends suggested that a majority could not happen, because Trudeau could not make the headway he needed in Quebec (the glass ceiling was 20 seats) . He needed to win Ontario and the rural seats outside of Toronto would ensure Liberals were kept to a minority. However, if one was to look back to late 2012 - early 2013 - it was clear that Trudeau had been able to bring many Liberals back to the fold. There was no reason he could not do it again once the party became the clear alternative to the Conservatives. The polls were showing that Quebec was going to deliver for the Liberals. The NDP were in trouble and the splits were all going the to the Liberals, with the exception of a dozen or so BQ seats . In the end the Liberals gained 33 seats for a total of 40! I told a former Progressive Conservative cabinet minister acquaintance of mine that it felt a lot like 1993, change was in the air. Canadian's felt a moral imperative to dump Harper and did they ever. Any political strategists that failed to notice the strong desire to dump Harper were probably indoctrinated in old polls, old strategies and old paradigms. They missed the building tsunami that was growing in force heading into the election before the vote. Three million more Canadians marked an x in this campaign than in the last. I doubt even a small fraction of these people voted Conservative or NDP. The Liberal vote doubled to 6.9 million votes. Voters showed up in greater numbers than in 2011 in every province and territory. I think a lot of people went to the polls with only one thing in mind - booting out Harper. They strategically decided that only one party could do that. Any sympathies, or loyalties, to candidates outside the Liberal Party were set aside. The result was similar to 1993 when Jean Chretien's Liberals were handed a landslide victory ending a decade of Progressive Conservative government that was marred in scandal and corruption. The Conservatives were adept at uniting the right and using the politics of fear to drive the Liberal Party into the ground over three elections. The poor handling of the sponsorship scandal, party infighting, the HRD $1 billion boondoggle, Shawinigate, and a succession of poorly executed national campaigns forced progressives to look for a new home. 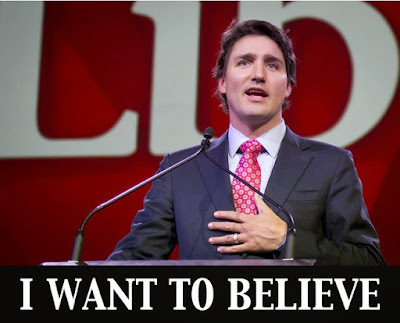 In February, I posted that I wanted to believe in the Liberal Party of Canada and in leader Justin Trudeau. I am a Trudeau Liberal – not a business liberal. That belief is not based on petty politics, machiavellian maneuvering or jumping on bandwagons for personal gain. I believe that we all should have equality of opportunity, that government’s role is to intervene to protect the weak from the strong, that we can not be indifferent towards the growing gap between the rich and the poor. I believe, and will always believe, in the Just Society envisaged by Pierre Elliot Trudeau. That is the Canada I am proud to be part of. I was empathetic to the late Jack Layton and captivated by Stephan Dion but neither could pull it together to usurp the Conservatives. I look forward to the Liberal's reversing draconian digital policy rules; to beefing up support for veterans; enhancing EI rules to reflect the realities of seasonal workers; to the return to science based decision making; to promised democratic reforms in how we finance elections and vote; to a fairer redistribution of taxation; to more accountability; to improved women's reproductive rights; to 21st century marijuana laws; a broad national infrastructure program; tax breaks for the middle class; a national public inquiry into missing and murdered aboriginal women; senate reform and a restoration in our pride of being the greatest nation to live on on this planet. Canada is back from the brink. I have great hope for Justin Trudeau.